After vacation travels which took us to Rome, Venice, and Cortina d’Ampezzo in the Dolomite Mountains of northern Italy, my wife and I recently visited Ljubljana, Slovenia, where she had an academic conference to attend. While she and her colleagues were reading scholarly papers to each other, I enjoyed two memorable days of fly fishing in some of the most beautiful water I’ve ever seen in the company of Rok Luštrik, one of the best guides I’ve ever had anywhere in the world. As we were making plans for the trip, and I started doing research about fly fishing in Slovenia, Rok’s name quickly emerged. The more I read about him and explored his website, the more impressed I grew, so I contacted him and was very pleased that he was available for the two days that I had to fish. The first day (Sunday 15 July 2007) we spent on the upper Sava River, near Bled. Actually we were on the Sava Bohinjka, one of the two main forks of the river, the other being the Sava Dolinjka. The two forks come together near Radovljica, and the main river eventually flows into the Danube at Belgrade. The Sava Bohinjka where we were fishing is a wide river flowing over a generally flat pebbly bottom; it is absolutely clear and about three feet deep in most places, with some deeper holes. The quarry this day were brook and rainbow trout and Adriatic grayling. In the early morning we were fishing mostly in faster riffles, and the fish, especially the little grayling and brook trout, were just way too fast for me at first. Time after time, Rok would see the minute movement of the strike indicator that signified a take, or actually see the fish move to the nymph we were using, and tell me “Go!” — and I would lift only to find the fish long gone. It took me some time to begin to see some of what Rok was seeing and to adjust the speed of my lift and set to the speed of the takes. I finally began to get the hang of things, and when Rok was satisfied that he didn’t have a completely incompetent angler on his hands, we moved to another stretch of the river, actually a trophy section, that held much bigger fish. This proved to be a rather different business — we were wading slowly and carefully down the middle of the stream, looking for larger fish holding in sunny patches near the bank. Except for the fact that we were wading down the middle of the waist-deep stream, this reminded me of fishing in New Zealand: stalking and casting to sighted fish. It seemed rather curious to me that the fish would choose hold in the sun instead of seeking out the shadows, which is the sort of behavior with which I am more familiar. Not so here, Rok assured me, and as usual, he was right. We never caught a fish from the shadows all day. We also never found any rising fish, nor did we encounter any significant insect hatch all day, just the occasional mayfly or sedge (caddis) fluttering by. It was sub-surface work all day. Local regulations permit the use of only one barbless fly, but do allow the addition of weight on the tippet, and a big part of the secret to success here is getting the weight (and consequently the depth of the drift) right. Rok prefers to use tungsten putty rather than split shot, believing that this make fine weight adjustments easier. In the late morning, Rok spotted a particularly large rainbow holding near a big rock, and we moved carefully into position to cast to him. The rainbow, however, wasn’t interested in the nymph pattern we’d been using with some success, nor in the scud pattern that we tried next. Rok then decided we should switch to a salmon egg pattern. When I asked why, he said that he didn’t know why it worked — there are some Danube salmon in the main river, but they don’t produce eggs the same way that Alaskan salmon do — he just knew that it did work. Apparently the idea that salmon eggs = good food is somehow encoded into a rainbow’s DNA. And work the salmon egg did: the big rainbow took it on the second or third drift, and then took us a couple of hundred feet downstream before he was ready to come to Rok’s net. After taking several photos and estimating his weight at 6 pounds, we revived and released him go, and then Rok reached out and shook my hand, saying “Welcome to Slovenia!” Welcome, indeed! A bit later in the morning, Rok went downstream to speak with another angler, and I was on my own for a while. I found two nice rainbows holding together, about a foot apart, one slightly downstream from the other. I had changed to a scud pattern and caught a couple of small fish with it, but the larger rainbows weren’t interested in the scud, so I switched back to a salmon egg and on the third or fourth drift, the closer of the two rainbows took it and charged off downstream. I followed him downstream for maybe 100 feet and eventually landed and released him, a fine, chunky 18-incher. When I worked my way back upstream the other fish was still on station, so I put the same egg pattern past him. He moved toward it just slightly, then turned back. When he repeated this two more times, I got the idea that he didn’t want a salmon egg for lunch today. Rok was still away downstream, so I thought to myself, “I’ll show this fellow something he’s probably never seen before,” and tied on a largish red and brown San Juan worm from my own box. And would you know, on the very first drift, bang! That rainbow, a virtual twin to his buddy, ate that San Juan worm like it was the finest thing he’d ever seen! That was a satisfying moment. When I later told Rok what had happened and showed him the fly, he seemed slightly mystified as to why it should have worked so well. Maybe “variety is the spice of life” for fish as well as for people! After a stop for lunch (good pizza and better beer at a local restaurant), we returned to the river, but things were pretty slow for most of the afternoon. Finally in the late afternoon we found another good rainbow holding, and made a number of casts to him. He didn’t want any of our nymph or scud patterns, so out came the salmon egg again, and again it did the job on the third or forth drift, resulting in my second really good rainbow of the day, this one around 4 pounds, but beautifully colored. That fellow made a good ending for my first day of fishing in Slovenia. On the second day (Monday, 16 July 2007), since I really wanted a shot at one of Slovenia’s famous marble trout, Rok said we would have to take a two-hour drive from Ljubljana through Kranjska Gora and across the VršiÄ Pass to fish the upper Soča River and one of its tributaries, the Lepenja, in the Trenta Valley in the northwest corner of Slovenia. The drive itself proved a memorable experience; the road across the Vršič Pass approaches a 14% grade at points, and has 25 numbered and signposted hairpin turns going up, topping out at 1611 m. (5285 ft.), and an equal number going down. Most of the turns are cobbled, rather than paved with asphalt, for better traction. The views along the way are quite simply stunning. The road was constructed in more or less its present form during World War I by Russian soldiers captured on the Eastern front by German and Austro-Hungarian forces and shipped here to help open the passes of the Southern front, where the Austro-Hungarians were entrenched opposite the Italians. Hundreds of them died during the construction, and what is known as the Russian Chapel, still an often-visited shrine, was constructed in their memory on the side of the mountain. As you descend into the peaceful Trenta Valley and see the waters of the Soča River flowing gently below, it’s almost impossible to visualize this area as having been a major battlefront during World War I. It was better known in the West as the Isonzo Front, and was made famous by Ernest Hemingway, who as a young man was wounded while driving an Italian ambulance through these hills, and who later described the final collapse and retreat of the Italian army in his celebrated and semi-autobiographical novel A Farewell to Arms. One can still occasionally see the remains of concrete fortifications and the rusted metal of old gun emplacements along the river and in the surrounding hills. Today the valley is quiet, and through it flows a beautiful clear river, emerald green in the deeper pools where the light reflects off the limestone sand, that holds marble trout, Adriatic grayling, and some very large rainbows. The first small run that we fished on the Lepenja, adjacent to a popular campground and just upstream from its confluence with the Soča, featured a blue-green pool about two feet deep beside a large boulder that held a number of clearly visible fish. The first trout to take my nymph, sure enough, was indeed a small marble trout — not very large, but with good coloration and a beautiful pattern. In one sense, my “mission” was accomplished: I had now held a real Slovenian marble trout (salmo trutta marmorata), one of the fabled “ghosts of the Soča,” in my own two hands! The day was only beginning, however, and that same pool soon produced another small marble trout, and then small rainbow, when suddenly something much larger pounced on the small nymph. When I set the hook, a very nice 19-20" rainbow exploded into view, and Rok exclaimed in surprise, “Where the hell did that come from? !” I felt much the same, I assure you, and was gratified when I was able to bring him to Rok’s net a few minutes later. Working upstream in the Lepenja, we eventually came to another similar but much larger pool, which again held a number of clearly visible fish. After a bit of study, Rok identified several of them as marble trout, including one particularly nice one, and one as an equally nice rainbow. We put the same nymph we’d been using through the pool several times, producing a couple of smallish marble trout, and then, finally, came the best one of the day, a deep olive-green colored, beautifully marked, and surprisingly strong specimen of about 18". What a thrill! And the photos that Rok took of him came out very nicely. Marble trout are known to be genetically related to the brown trout found throughout Europe, and now also in some rivers in Slovenia, but they evolved differently through history and developed different coloration, which ranges from a deep olive-brown or olive-green to a light silvery-green, and distinctive marking patterns which sometimes extend far down onto the belly, which is usually yellowish-white or olive-white. Their markings often look like those of a piece of cut and polished marble stone, hence the name. They have unusually large heads in comparison to other trout species, including browns; the head of a marble trout can be 20%-25% of its total length. They fight like browns, at least in my experience, with dogged head-down power, rather than the fast runs and aerial acrobatics that rainbows so often display. The “true” marble trout now exists only in northeastern Italy and northern Slovenia, in streams that drain into the Adriatic Sea. The marble trout can cross-breed with brown trout, and the resulting hybrids are fertile. A good deal of effort is being expended in Slovenia these days to protect the “true” marble trout from being hybridized out of existence. Rok told me that the marble trout I’d just caught and released was about as good a specimen of the species as I was likely to catch, at least using the tackle and tactics we were using. Marble trout, like browns, become exclusively carnivorous at a certain point in their development, and that point seems to come earlier for marbles than for browns. The 18" marble that I caught already had already grown surprisingly large and very sharp teeth. Thus an angler who wants to catch a really large marble trout would need to target the (much) deeper water where they hold in the lower Soča, fishing large streamer patterns at dawn or at dusk (night fishing is illegal in Slovenia), or move to the lake into which both the Soča and the Idrijca rivers flow (the Most na Soči Reservoir, created by the Doblar hydroelectric dam) and exchange a fly rod for heavy spinning gear. 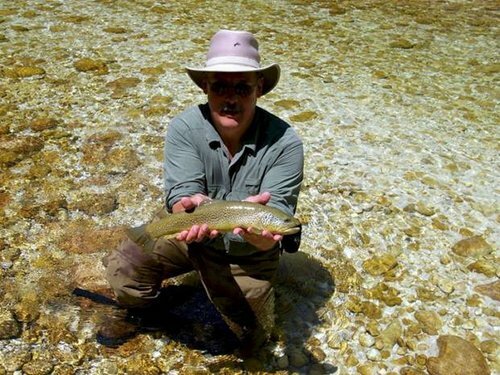 Marble trout actually grow larger than either browns or rainbows. The world-record marble trout, measuring 47.5 inches and weighing 55.1 pounds, is displayed at Hotel Hvala in Kobarid, just a few miles from the Soča River where it lived out its long life — it was not caught by an angler, but found dead on the shore of the stream, apparently of natural causes. That nice rainbow was still there in the pool from which the good marble had come, and after a couple of fly changes and some tinkering with the weight, he eventually took the nymph — and then took off upstream through the pool like a rocket, jumping a good two feet straight up at the end of his run, then dashed back downstream again. I managed to stop his downstream run, then perfectly executed an “LDR” (“long-distance release”) on him — meaning, of course, that the rainbow slipped the hook. Rok was not previously familiar with the term “LDR” though he certainly recognized the experience. That rainbow’s antics had thoroughly disrupted the pool, so we took a break for lunch at the campground café, then moved downstream to fish the main stream of the Soča. Shortly after lunch, Rok’s salmon egg pattern proved its worth again in a large deep run, this time producing one of the two best fish of the entire trip — a huge (at least to my eyes!) rainbow that Rok estimated at around 8 pounds, an estimate that I was not inclined to question. This was a really beautiful fish, brightly colored, thick and well muscled, and strong! It put up quite a fight, and its power was impressive. It was quite a thrill to cradle the biggest and best rainbow I’ve ever held in my hands — and I have good photos taken by Rok (who proved to be a first-rate photographer as well as a first-rate guide) to prove it! We then gradually worked our way downstream, concentrating on good pools and runs and catching the occasional fish, until Rok identified a stretch of water that he was confident held grayling. As usual, he was right, and after lengthening the tippet, adjusting the weight, and changing the nymph for a scud pattern, out of that stretch came what was by far my best grayling of the trip, a fine fat fellow of close to 2 pounds. Rok explained that this was a good example of the Adriatic grayling, distinguished from his cousin the Danube grayling mainly by the silvery-gray sides and yellowish coloration of the fins and tail. When we had released the grayling and were walking downstream again, Rok looked at me and said “I don’t know what else this river has to show you.” The day had already produced several marble trout including one particularly fine specimen, quite a number of rainbows including that really large one, and now a very nice grayling. I grinned back at him and said, “Well, let’s see what the rest of the afternoon brings.” Soon after that, the action slowed considerably, and it seemed as if the river itself had decided that it didn’t have anything else to show me. Rok said at one point that I should continue on my own while he went back to move the car downstream to our final take-out point. While he was gone to collect the car I continued to fish my way downstream, finding some good-looking water but having very little luck on my own, and missing the set on the couple of takes that I did get from decent fish. I honestly don’t know if I just wasn’t seeing or finding the fish that may have been there, or if they were all taking an afternoon siesta. I had hoped that we might find a decent insect hatch of some sort, but that was not to be the case all day. When we got back together again after Rok brought the car downstream, he directed me to a deep pool and run even farther downstream, a truly beautiful spot where the salmon egg pattern scored yet again, this time producing the second biggest fish of the trip, a lovely rainbow who was fully 7 pounds — maybe not quite as large as the other big one, but not missing the mark by much. It was about 4:30 pm by the time we had landed, photographed, revived and released that last memorable rainbow, and I looked at Rok and said “I think it’s time to go home — after that fellow, anything else is almost certainly going to be anticlimactic.” Rok would have stayed out far longer had I wanted to do so, but the landing and release of that fine fish seemed to me a good and appropriate moment to bring to a close two of the finest days of fly fishing that I’ve ever been privileged to enjoy — and we still had a two-hour drive to make back across the VršiÄ Pass to Ljubljana. Throughout the two days, my beloved old Sage RPL 490-4 rod and trusty Lamson LP2 reel proved perfectly suited to the work at hand, suitably protecting the 5X tippet we were using both days while capably stopping and turning even the biggest rainbows. Rok prefers to use Stroft, a German tippet material that I had never encountered but which performed impressively; we had no knot failures during the two days and no break-offs that could be blamed on the tippet. I was also very pleased with the performance of the new Scientific Anglers “Mastery” GPX WF4F line that I had put on the reel just before the trip. I took an identical 6-weight setup with me (Sage RPL 690-4 rod and Lamson LP3 reel with GPX WF6F line), being a little unsure of what I might encounter, but never took it out of the case. Packing your own gear to a destination like Slovenia can be something of a hassle in these days of increased airline security and restrictive regulations, but for my money it’s worth it to fish with gear with which you are familiar and comfortable. And for the record, I carried the rods (both 4-piece, in their metal tubes) and reels, along with my fly boxes, onto all our air flights in an Orvis Battenkill canvas case; waders, boots, vest, etc., went into a small duffle bag that was checked as luggage. The only place where I had any question at all asked about the contents of the carry-on case was coming out of Slovenia. The airport security people in Ljubljana did not seem to be very familiar with fly-fishing gear. I was initially told that I’d have to check the case, but after a brief conversation about the nature of the gear, I was allowed to carry it onto the plane. In Atlanta, Rome, Venice, and Paris, I had no questions or problems at all in regard to the carry-on case and its contents. I’m not the world’s most experienced or well-traveled angler, but I have had a chance to fish some good waters with some good guides around the US and in places like New Zealand, Poland, and Norway. Along the way I’ve encountered some guides who were good and some who were not so good, and Rok Luštrik ranks way up at the top of the list for me. 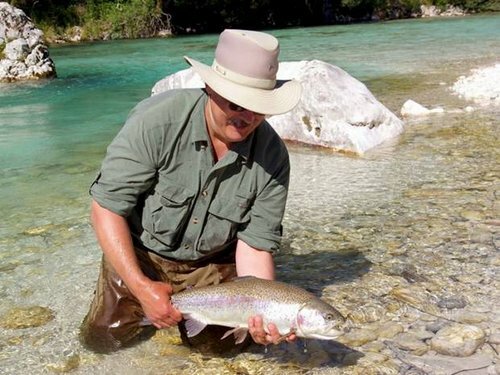 Rok knows his streams and the fish that they hold with an intimacy born of long experience. He is highly skilled, patient, cheerful, knowledgeable, helpful, and friendly. He will provide the degree of assistance that you want and request, but is not always in your back pocket — he’ll leave you alone to the degree that you want to be left alone. Rok speaks completely fluent English and is a very enjoyable conversation partner, and in addition to his fishing skills and guiding abilities, he’s also a really fine photographer. He took quite a number of photos during our two days on the water together — not only the usual photos of me holding and releasing good fish, but also of me fishing, often when I was unaware that he was shooting, showing the almost unbelievable beauty of the water and the surrounding countryside. When we got back to Ljubljana on the last day, while we enjoyed a beer in the bar of my hotel, he fired up his laptop, downloaded the photos from his digital SLR camera to the laptop, and then burned them onto a CD for me. Talk about service! I am very pleased to give Rok an enthusiastically positive recommendation to any angler who travels to that beautiful part of the world. I myself hope to return to Slovenia in the not-too-distant future, and when I do, I certainly will be getting in touch with Rok to arrange some fishing with him.